I just heard an ice cream truck driving through our neighborhood! 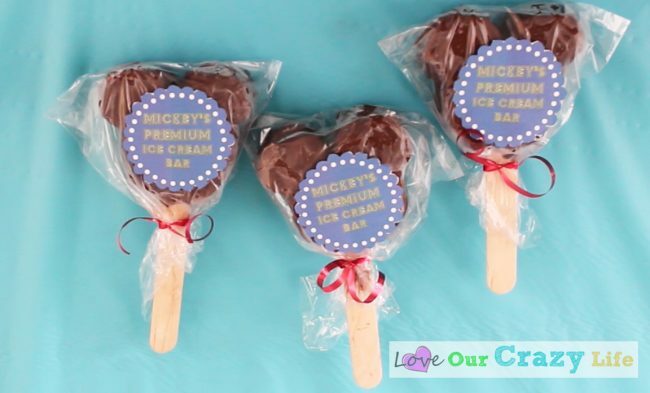 One of my favorite ice cream treats is the Mickey’s Premium Ice Cream Bars. Problem is, they only sell them in the Disney parks…so that ice cream truck was not going to be selling them. 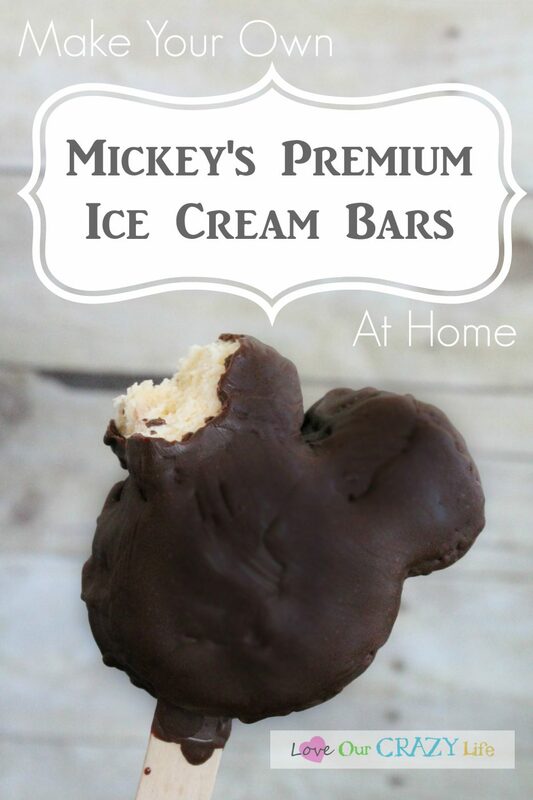 But that is okay because I had this idea a few months ago on how to make Mickey’s Premium Ice Cream Bars at home. I was so excited when it worked out, that I had to share it with you NOW! So here I am, sharing it with you to ring in spring! These are pretty easy to make but you will need a day or two to make them just simply because you are working with ice cream which will melt if out too long. Before you start make sure you have a Mickey Mouse shaped LARGE cookie or sandwich cutter like this one HERE (affiliate link). You want to make sure it is big enough so I encourage you to read the sizes on any cookie cutters you pick out. 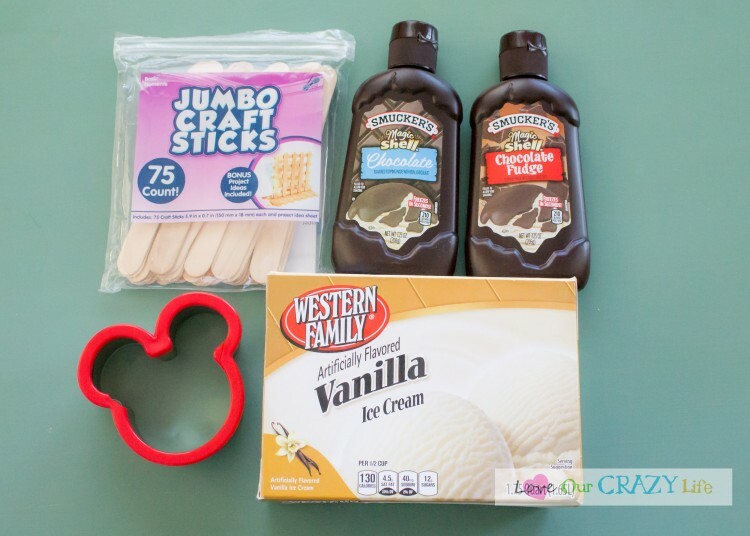 You will also need vanilla ice cream, large craft/popsicle sticks, and the Magic Candy Shell (you find it by the ice cream toppings) in Chocolate Fudge. If you find the original Mickey’s Premium Ice Cream Bars in the parks a little rich, then you could go for just the regular chocolate shell, but if you want the taste closest to the parks, get the Chocolate Fudge version. You will also want ziplock bags, wax paper, a microwave safe bowl, and something to put the bars on as you work on them (cookie sheet). First, put your cookie sheet or surface you want to use to work on and put the bars on in the freezer to cool it down. It should really only take like 30 minutes at most (if that) to cool it down. Then, you need to make layers of your vanilla ice cream. 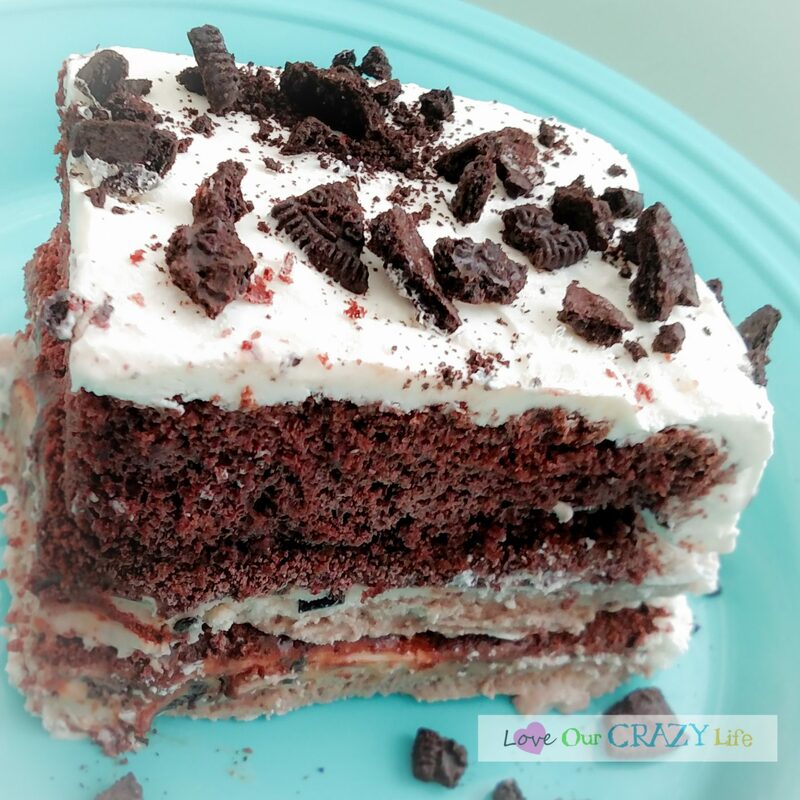 I opened the box and cut the layers with a knife (once the ice cream had softened) but if I were to do it again (which I will be) I will use my kitchen aid and prepare a layer of vanilla ice cream like I did in the 7 Layer Ice Cream Cake. Then I would freeze it again until it was pretty firm. You want layers that are at least 2 inches thick. 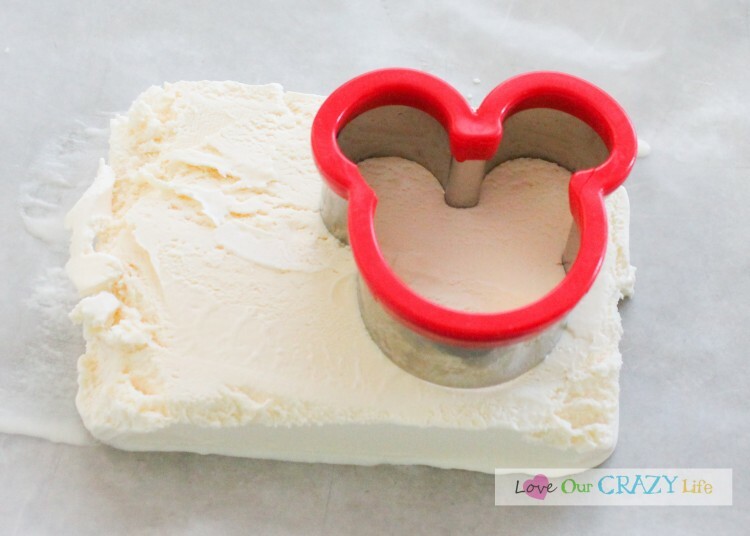 Next, use your sandwich cutter to cut out Mickey Mouse shaped ice cream patties. Now, My ice cream at this point was too soft to put the popsicle sticks in, but if yours is not too soft, you can put them in now, and then stick them in individual ziplock baggies to freeze. For me, I stuck the Mickey head in a baggie, and 45 minutes later stuck in the popsicle sticks. Then I let the Mickey Mouse ice cream heads freeze until they were nice and hard. For me this was over night because we just used the freezer on our fridge, and we were getting into a lot for other things. If you have a chest or upright deep freezer, 3-4 hours should be plenty. Now it is time to put on the chocolate shell. I wish I had pictures of this, but since I had to work so fast, I didn’t think to take pictures. When you are ready to put on the shell, shake the topping REALLY well to make sure it mixes. Pour the topping into a microwave safe bowl. Get out wax paper and line a small cookie sheet or other tray that will fit in your freezer. TIP: If you want prettier looking Mickey’s Premium Ice Cream Bars, be sure when you take the ice cream out of the bags that the sides/edges are nice and smooth. Now taking out your Mickey Mouse shaped ice cream heads and using a basting brush, brush on the candy shell topping. Do one side completely first, then work on the edges and then the back side. By the time you get to the second side the first side should be pretty hard so you can lay it on the tray. Do this with each Mickey Mouse head. Keep stirring your topping as you go. If it starts to harden, you can place it in the microwave for 10-15 seconds and then stir when you take it out. These ones below are not the prettiest, but they tasted FANTASTIC. If you want to make them prettier, simply go over them with a second coat of shell. Once you have them all coated, place the tray back in the freezer. You can eat them anytime, but we waited over night so they would be a little more frozen. Even with waiting, they weren’t as frozen as they are at Disney but that might be a good thing. The BEST Ice Cream at the Disneyland Resort! It just so happens we’ve already got the sandwich cutter! I wonder if I canveganize these. Thanks for the inspiration! Sounds like a bit of work, but a Mickey Bar would be worth it! I’ll share this with my wife and see if I can sweet talk her into giving it a try! 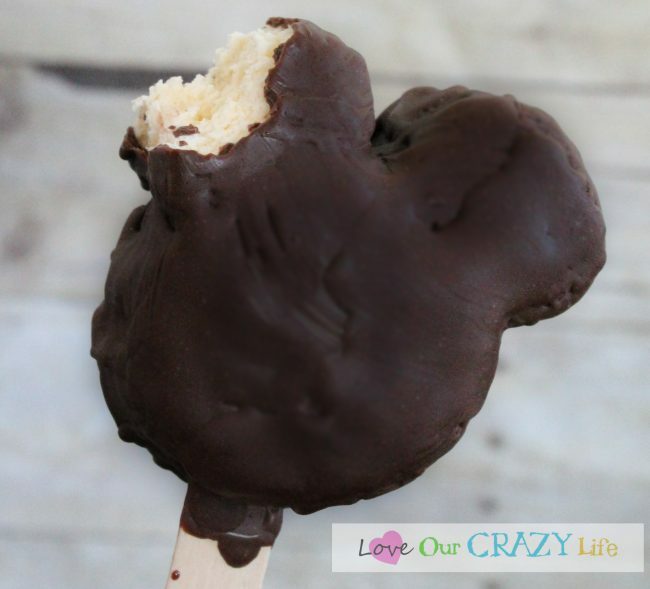 With the one container of ice cream and one magic shell container we were able to make 7 Mickey Premium Ice Cream Bars and ours were pretty thick. I had never thought of Magic Shell for something like this. Genius! Love this! Mickey ice cream bars are my favorite treats at the parks. I can’t wait to try making some at home! So I have always wanted to make these…but never THOUGHT of MagicShell! Hello! Game changer! It’s so simple, but never even crossed my mind!